The McDonnell Douglas MD-11 is an American three-engine medium to long-range widebody airliner, with two engines mounted on underwing pylons and a third engine at the base of the vertical stabilizer. It is based on the DC-10, but featuring a stretched fuselage, increased wingspan with winglets, refined airfoils on the wing and tailplane, new engines and increased use of composite materials. It also features an all-digital glass cockpit that decreases the flight deck crew from the three required on the DC-10 to two by eliminating the necessity for a flight engineer. Although the MD-11 program was launched in 1986, McDonnell Douglas started to search for a DC-10 derivative as early as 1976. Two versions were considered then, a DC-10-10 with a fuselage stretch of 40 feet (12.19 m) and a DC-10-30 stretched by 30 ft (9.14 m). That later version would have been capable of transporting up to 340 passengers in a multi-class configuration, or 277 passengers and their luggage over 5,300 nautical miles (9,800 km). At the same time, the manufacturer was searching to reduce wing and engine drag on the trijet. Another version of the aircraft was also envisaged, the "DC-10 global", aimed to counter the risks of loss of orders for the DC-10-30 that the Boeing 747SP and its range were creating. The DC-10 global would have incorporated more fuel tanks. While continuing its research for a new aircraft, McDonnell Douglas designated the whole program as the DC-10 Super 60, having previously been known for a short time as DC-10 Super 50. The Super 60 was to be an intercontinental aircraft incorporating many aerodynamic improvements on the wings, and a fuselage lengthened by 26 feet 8 in (8.13 m) to allow up to 350 passengers to seat in a mixed class layout, compared to the capacity of 275 in the same configuration of the DC-10. Following more refinements, the DC-10 Super 60 project was proposed, as of 1979, in three distinct versions like the DC-8. The DC-10-61 aimed to be a US domestic aircraft, able to carry 390 passengers on an airframe lengthened by 40 ft (12 m). Like for the DC-8, the series 62 was proposed as an intercontinental aircraft stretched by 26 ft 7 in (8.10 m) and capable to carry up to 350 passengers. And finally, the series 63 would have incorporated the same fuselage as the DC-10-61 as well as all the aerodynamic refinements of the -62. After the three DC-10 accidents in 1979 (American Airlines Flight 191, Western Airlines Flight 2605 and Air New Zealand Flight 901) which received great media coverage, the trijet program was seriously damaged by doubts regarding its structural integrity. For these reasons, and due to another downturn in the airline industry, all work on the Super 60 was stopped. In 1981, a Continental Airlines DC-10-10 was leased to conduct more research and particularly the effects the then newly-designed winglets could have on aircraft performance. Different types of winglets were tested during that time in conjunction with NASA. McDonnell Douglas was again planning new DC-10 versions that could incorporate winglets and more efficient engines developed at the time by Pratt & Whitney (PW2037) and Rolls-Royce (RB.211-535F4). The manufacturer finally rationalized all these studies under the MD-EEE designation, that was later modified to MD-100 following some more changes. The MD-100 was proposed in two versions: the Series 10, having an airframe shorter by 6 ft 6 in (1.98 m) compared to the DC-10 and seating up to 270 passengers in a mixed class configuration; and the Series 20, incorporating a fuselage stretch of 20 ft 6 in (6.24 m) over the DC-10 and able to seat up to 333 passengers in the same kind of configuration as the Series 10. Both versions could be powered by the same engine families as the actual MD-11 plus the RB.211-600. But the situation for the manufacturer, and the airline industry in general, did not look bright. No new DC-10 orders were received, and many among the observers and customers doubted that the manufacturer would be around for much longer. Thus, the Board of Directors decided in November 1983 to cease once more all work on the projected new trijet. Good times were back the following year and airlines were placing repeat orders for the MD-80 series jets that had helped the manufacturer to travel through the past difficult years. No new orders for the DC-10 had been received, (which inspired McDonnell Douglas even more to create a replacement) but the production line was nonetheless kept active thanks to a previous order for 60 KC-10A tankers from the USAF. McDonnell Douglas was still convinced that a new derivative for the DC-10 was needed, as shown by the second-hand market of its Series 30 as well as for the heavier DC-10-30ER version. Thus, in 1984 and for the first time, a new derivative aircraft for the DC-10 was designated MD-11. From the very beginning, the MD-11X was conceived in two different versions. The MD-11X-10, based on a DC-10-30 airframe, offered a range of 6,500 nmi (12,038 km) with passengers. That first version would have had a Maximum Take-Off Weight (MTOW) of 580,000 pounds (263,157 kg) and would have used CF6-C2 or PW4000 engines. The MD-11X-20 was to have a longer fuselage, accommodating up to 331 passengers in a mixed class layout, and a range of 6,000 nmi (11,100 km). As more orders for the DC-10 were received, McDonnell Douglas used the time gained before the end of DC-10 production to consult with potential customers and to refine the proposed new trijet. In July 1985, the Board of Directors finally authorized the Long Beach plant to offer the MD-11 to potential customers. At the time, the aircraft was still proposed in two versions, both with the same fuselage length, a stretch of 22 ft 3 in (6.93 m) over the DC-10 airframe, as well as the same engine choice as the MD-11X. One version would have a range of 4,780 nmi (8,840 km) with a gross weight of 500,000 lb (227,000 kg) and transport up to 337 passengers, while the second would carry 331 passengers over 6,900 nmi (12,800 km). A year later, as several airlines had committed for the MD-11, the situation was looking optimistic. The aircraft was now a 320 seater baseline and defined as an 18 ft 7 in (5.66 m) stretch over the DC-10-30 powered by the new advanced turbofans offered by the major engine manufacturers and giving it a range of 6,800 nmi (12,600 km). Other versions, such as a shortened ER with a range of 7,500 nm (13,900 km), an all cargo offering a maximum payload of 200,970 lb (91,080 kg) and a Combi with a provision for ten freight pallets on the maindeck, were proposed. Further growth of the aircraft was also foreseen, such as the MD-11 Advanced. Finally, the MD-11 was launched on December 30, 1986 with commitments for 52 firm orders and 40 options in three different versions (passenger, combi and freighter) from ten airlines (Alitalia; British Caledonian; Dragonair; FedEx Express; Finnair; Korean Air; Scandinavian Airlines System; Swissair; Thai Airways International and Varig) and two leasing companies (Guinness Peat Aviation and Mitsui). Orders from Dragonair, Scandinavian and UTA, an undisclosed customer, were canceled by 1988. Assembly of the first MD-11 began on March 9, 1988, and the mating of the fuselage with wings occurred in October that year. First flight was originally planned to occur in March 1989, but numerous problems with the manufacturing, delays with suppliers producing essential components and labor industrial actions led the ceremonial roll out of the prototype to happen only in September that same year. The following months were used to prepare the prototype for its maiden flight, that finally happened on January 10, 1990. The first two aircraft manufactured were intended for FedEx and thus, were already fitted with the forward side cargo door. They remained with the manufacturer as test aircraft until 1991 before being completely converted to freighter and delivered to their customer. FAA certification was achieved by November 8, 1990 while the European Joint Aviation Authorities (JAA) certified the MD-11 on October 17, 1991 after approximately 200 separate issues were resolved. 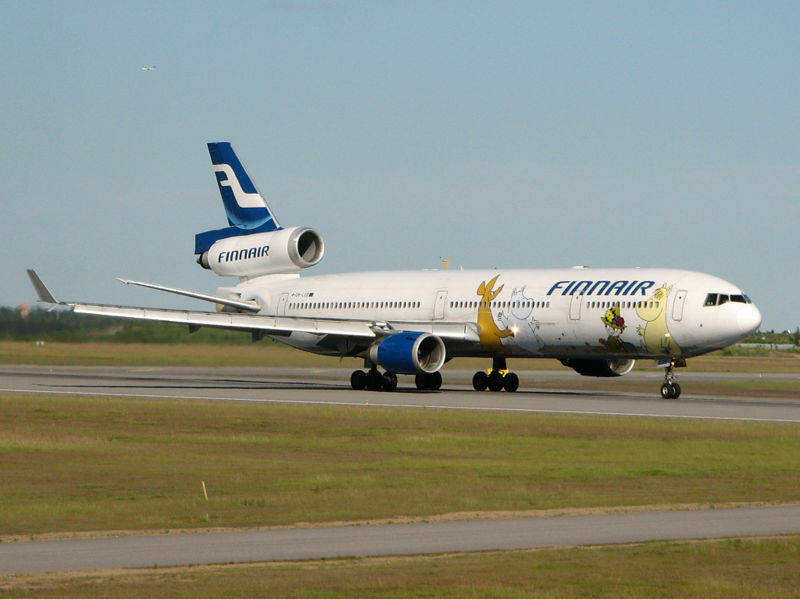 Finnair MD-11 decorated with Moomin characters. 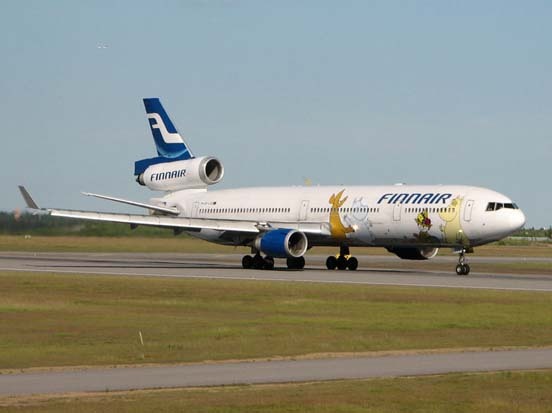 The first MD-11 was delivered to Finnair on December 7, 1990 and accomplished the first revenue service by an MD-11 on December 20, 1990, when the aircraft carried passengers from Helsinki to Tenerife in the Canary Islands. First MD-11 service in the U.S. was inaugurated by Delta Air Lines, also in 1990. It was during this period that flaws in the MD-11's performance began to become apparent. It failed to meet its targets for range and fuel burn. American Airlines in particular was unimpressed, as was Singapore Airlines, which canceled its order for 20 aircraft. 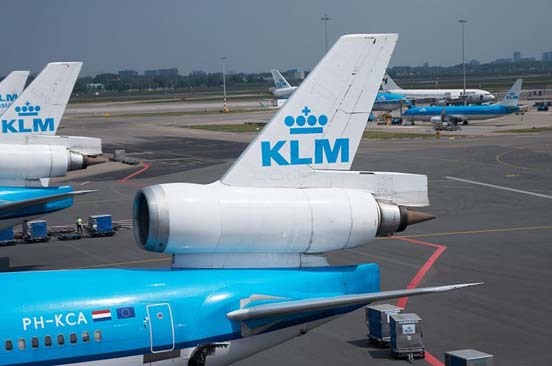 The former cited problems with the performance of the airframe and the Pratt & Whitney PW4000 engines selected for its use as reasons of the cancellation while the latter said that the MD-11 cannot fulfill the airline's long haul routes. The figures revealed exclusively to Flight International show that, based on pre-flight estimates, the P&W-powered MD-11 should have been capable of a 7,000 nautical miles (12,950 km) range with 61,000 pounds (27,680 kg) of payload. Even with the Phase 1 drag reduction in place then, the aircraft could only achieve its full range with 48,500 lb (22,000 kg) of payload, or a reduced range of 6,493 nm (12,025 km) with a full payload. In 1990, McDonnell Douglas with Pratt & Whitney and General Electric began a modification program known as the Performance Improvement Program (PIP) to improve the aircraft's weight, fuel capacity, engine performance, and aerodynamics. McDonnell Douglas worked with NASA's Langley Research Center to study aerodynamic improvements. The PIP lasted to 1995 and recovered the range for the aircraft. However, the damage was already done. The MD-11 was one of the first commercial designs to employ a computer-assisted pitch stability augmentation system that featured a fuel ballast tank in the tailplane, and a partly computer-driven horizontal stabilizer. Updates to the software package have achieved a situation where the plane's handling characteristics in manual flight are comparable to the DC-10, despite a much greater fuel efficiency achieved by the lessened drag of the smaller tailplane. After McDonnell Douglas merged with Boeing in 1997, the new company announced that MD-11 production would continue, as a freighter. However, in 1998 Boeing announced it would end MD-11 production after filling current orders. The last two MD-11s were manufactured during June and September 2000, and delivered to Lufthansa Cargo on February 22 and January 21, 2001 respectively. Production ended because of lack of sales, due to internal competition from comparable aircraft, such as the Boeing 777 and external competition from the Airbus A330/A340. Also, two engines are generally less expensive to operate and maintain than three. Since there was a large demand for cargo aircraft and because there was no 777 cargo version available at the time, many airlines using the MD-11 were anxious to switch to the 777 as they had no problems selling their used MD-11s to cargo operators. McDonnell Douglas and later Boeing performed studies on the feasibility of removing the tail engine and making it a two engine plane, but nothing came of it. McDonnell Douglas originally projected that it would sell more than 300 MD-11 aircraft, but only a total of 200 planes were built. The MD-11 was assembled at McDonnell Douglas's Douglas Products Division in Long Beach, California (later Boeing's). In August 2006, a total of 191 MD-11 aircraft were in airline service. Engine #2 mounted at the base of the vertical stabilizer. The MD-11 was manufactured in five variants. MD-11 (131 built): the Passenger variant, sometimes referred to as MD-11P, was produced from 1988 to 1998. It was the first version on offer at launch of the aircraft in 1986, and was delivered to: Alitalia (3); American Airlines (19); China Airlines (5); China Eastern Airlines (5); City Bird (3); Delta Air Lines (17); EVA Air (3); Finnair (7); Garuda Indonesia (6); Japan Air Lines (10); KLM Royal Dutch Airlines (10); Korean Air (5); LTU International Airways (4); Saudi Arabian Royal Flight (2); Swissair (16); Thai Airways International (4); Varig (6); VASP (6) and World Airways (3). MD-11C (5 built): the Combi was the third variant on offer at launch in 1986 and was designed to accommodate both passengers and freight on the main deck which feature a rear cargo compartment for up to ten pallets accessible by a large rear port side cargo door (160 in x 102 in - 4.06 m x 2.59 m) for a main deck cargo volume of 10,904 cubic feet (309 cubic m). Pallets dimensions are 88 in X 125 in (2.23 m x 3.18 m) or 96 in x 125 in (2.44 m x 3.18 m). Additional freight is also carried in below deck compartments. The MD-11C can also be configured as an all passenger aircraft. All five aircraft were manufactured between 1991 and 1992 and delivered to Alitalia, the only customer for that variant. 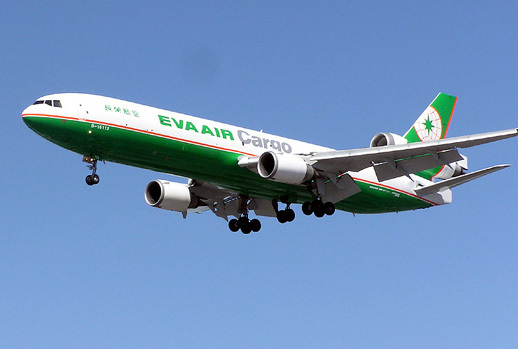 They have been converted to full freighter in 2005 and 2006 to be operated by the airline's cargo division, before being retired and returned to their lessor in January 2009 following the division's closure. MD-11CF (6 built): the Convertible Freighter variant was launched in 1991 by an order from Martinair for 3 aircraft plus two options. The MD-11CF feature a large forward port side cargo door (140 in x 102 in - 3.56 m x 2.59 m) located between the first two passenger doors, and can be used in an all passenger- or in an all cargo-configuration. As a freighter, it can transport twenty six pallets of the same dimensions (88 in X 125 in (2.23 m x 3.18 m) or 96 in x 125 in (2.44 m x 3.18 m)) as for the MD-11C and MD-11F for a main deck cargo volume of 14,508 cubic feet (410.8 cubic m) and offers a maximum payload of 196,928 lb (89,325 kg). All six MD-11CFs were delivered to Martinair (4) and World Airways (2) during 1995. 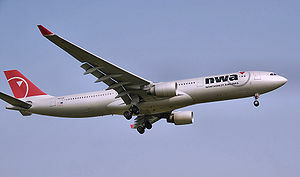 The two World Airways aircraft have been converted to freighter-only in 2002. MD-11ER (5 built): the Extended Range version was launched by the manufacturer at the Singapore Air Show in February 1994. The MD-11ER incorporates all the Performance Improvement Program (PIP) options, including a Maximum Take-Off Weight of 630,500 lb (286,000 kg) and an extra fuel tank of 3,000 US gallon (11,400 liters) in the forward cargo hold to offer a range of 7,240 nm (13,410 km), an increase of 400 nm (750 km) over the standard passenger variant. MD-11ERs were delivered between 1995 and 1997 to Garuda Indonesia (3) and World Airways (2). As of February 2007, one MD-11ER has been converted to MD-11 with the removal of the extra fuel tank. This aircraft is in service with Finnair. MD-11F (53 built): the Freight transport aircraft was the second variant on offer at launch in 1986 and was the last and longest (1988-2000) manufactured version. The all-cargo aircraft features the same forward port side cargo door (140 in x 102 in - 3.56 m x 2.59 m) as the MD-11CF, a main deck volume of 15,530 cubic feet (447 cubic m), a maximum payload of 200,151 lb (90,787 kg) and can transport 26 pallets of the same dimensions (88 in X 125 in (2.23 m x 3.18 m) or 96 in x 125 in (2.44 m x 3.18 m)) as for the MD-11C and MD-11CF. The MD-11F was delivered between 1991 and 2001 to China Eastern Airlines (1); EVA Air (9); FedEx Express (22); Lufthansa Cargo (14); Martinair (2); Saudi Arabian Airlines (4); World Airways (1). Note: Some or all the features of the MD-11ER, including the higher MTOW of 630,500 lb (285,990 kg), part or all of the PIPs aerodynamic improvements packages and composite panels were fitted to later built MD-11s (except the extra fuel tank), and could be retrofitted to any of the variants, except for the PIP Phase IIIB larger aft engine intake. Some airlines, such as Finnair, Martinair and FedEx have made the structural changes required to allow their aircraft to have the higher MTOW. Swissair 16 newly delivered aircraft were retrofitted with all the features except for the extra fuel tank and were so-designated MD-11AH for Advanced Heavy. Boeing and its group of international affiliates offer conversion services, which accept used passenger airliners and convert them to freighters. The MD-11BCF is one of the models offered; another is the MD-10BCF, which is a McDonnell Douglas DC-10 retrofitted with a glass cockpit that eliminates the need for a flight engineer. In August 2008, a total of 188 MD-11 aircraft (all variants) were in airline service, including FedEx Express (58), UPS Airlines (36), Lufthansa Cargo (19), World Airways (11), KLM Royal Dutch Airlines (10) and other operators with fewer aircraft of the type. Most of the airlines having ordered the MD-11 for their long-haul regular or charter passenger flights have replaced their fleet of the type with Airbus A330, A340 and Boeing 777 aircraft by the end of 2004 or, in some case, converted their MD-11s to freighters such as China Eastern and Korean Air. The South Korean airline announced as early as December 1994 its intention to remove the MD-11 from its passenger services and to use its five aircraft on medium-range cargo routes, less than four years after the first was delivered. One year later, American Airlines signed an agreement to sell its nineteen aircraft to FedEx with the first leaving the fleet in January 1996. 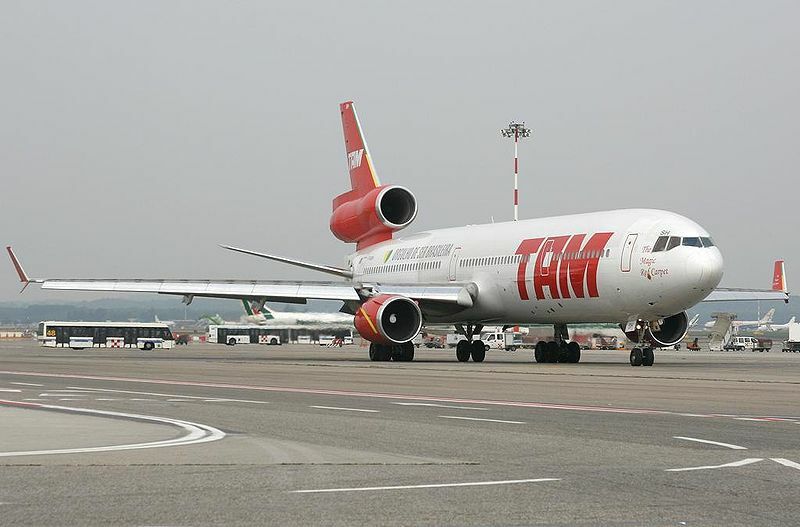 In October 2006, TAM Linhas Aéreas announced an order for 777-300ERs, expected to be delivered in 2008. 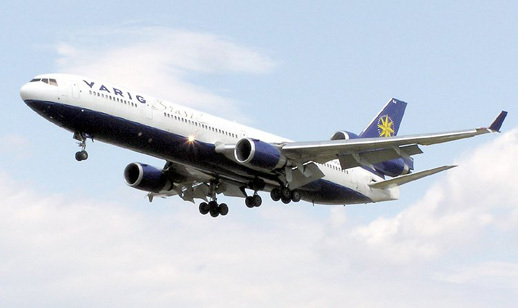 In the meantime, the airline decided to lease three MD-11s for its intercontinental services. In May 2007, Finnair has announced the sale of its last two self-owned MD-11s to Aeroflot-Cargo which are thus to become part of the Russian airline cargo fleet in 2008 and 2009. After sixteen years of services with Varig, the MD-11 was finally retired from the airline's fleet following the arrival of flight RG8741 from Frankfurt, Germany on June 9, 2007. As of December 14, 2008, Finnair (6) and KLM Royal Dutch Airlines (10) are the only airlines operating MD-11s on their regular intercontinental flights since TAM Linhas Aéreas retired its last aircraft in December 2008. World Airways is also operating 3 MD-11s, mainly for the Air Mobility Command, as well as two MD-11ERs, one of which is dedicated and specially configured for the "Houston Express", SonAir's three times weekly service between Houston and Luanda in Angola. Two MD-11s are also operated in a VIP configuration, one by the Saudi Arabian Airlines Royal Flight for members of the Royal family, and one by Asasco Aviation. Aeroflot-Cargo (3) - The Russian airline is to receive at least six MD-11F from 2008. Two aircraft are currently stored. Cargoitalia (1) - The Italian carrier has taken delivery on May 6, 2009 of its first MD-11F, previously operated by Alitalia Cargo. Centurion Air Cargo (1) - The Miami-based company specialized in Aircraft, Crew, Maintenance and Insurance (ACMI) wet-leases has taken delivery of a former Gemini Air Cargo MD-11F. The aircraft has been ferried from Goodyear in Arizona, where it was stored, to Miami in Florida on December 13, 2008, and appears in the airline's new identity Centurion Air Cargo and colors scheme. China Cargo Airlines (6) - This is a joint venture between China Eastern Airlines and China Ocean Shipping utilizing six former China Eastern aircraft. Ethiopian Airlines has taken delivery of its first MD-11F on January 31, 2009. EVA Air Cargo (8) - One member of the fleet was previously a passenger MD-11 and converted to freighter in 2003. FedEx Express (58) - The fleet is composed of 21 newly delivered aircraft and 37 second hand passenger aircraft converted to freighter coming from American Airlines, China Airlines, Delta Air Lines and Swiss International Airlines. The express carrier is to add two former TAM aircraft to its fleet, both previously intended for Aeroflot Cargo and Ethiopian Airlines. Lufthansa Cargo (19) - This airline was the last major to order MD-11s and received 14 of the freighter, including the very last MD-11 produced. In 2004 and 2005 it added to its fleet five former Alitalia (3) and Varig (2) passenger aircraft after having them converted to freighter. Martinair Cargo (7) - The Dutch company trijet fleet is composed of four MD-11CF currently used only for cargo flights as well as two newly delivered MD-11Fs and a former Swiss MD-11 converted to freighter. Saudi Arabian Airlines (4) - All newly delivered in December 1997 and January 1998 and operated on flights to Addis Ababa, Bangkok, Brussels, Hong Kong, Khartoum and Shanghai. Shanghai Airlines Cargo (4) - The Pudong International Airport based airline is currently utilizing four former EVA Air MD-11Fs. UPS Airlines (38) - UPS fleet of MD-11Fs is exclusively composed of second hand passenger aircraft converted having previously served with Delta Air Lines, Japan Air Lines, Thai Airways International, Swissair, VARIG, VASP and World Airways. World Airways (9) - Of the nine aircraft only one was built as freighter. Two were previously MD-11CFs and converted in 2002, two are former Korean Air aircraft, while the last one is the next to last MD-11 passenger built and converted to freighter in October 2006. The Peachtree City-headquartered airline has now added three more MD-11Fs, all formerly part of Gemini Air Cargo fleet. Former operators with highest number of aircraft for each in parentheses. Korean Air MD-11F (5) - all converted from MD-11. As of March 2009, the MD-11 was involved in 12 incidents, including six hull-loss accidents, with 235 fatalities. China Eastern Flight 583, a MD-11 went into severe oscillations on April 6, 1993 when a crew member accidentally deployed the slats during cruise flight over the Pacific Ocean. Two passengers ultimately died. FedEx Flight 14, N611FE, crashed during a landing at Newark Liberty International Airport, New Jersey on July 31, 1997. The aircraft flipped onto its back and subsequently burned, following a landing attempt from an unstabilized flare. Swissair Flight 111, HB-IWF, crashed into the Atlantic Ocean on September 2, 1998 while en route from New York City to Geneva, Switzerland. All 229 people on board perished. The cause of the crash was determined to be a fire caused by improper wiring of Swissair-added passenger entertainment system units. The fire started at the front of the aircraft and quickly grew uncontrollable, attributed partly to the poor flame retardant properties of its metalized mylar insulation. Korean Air, HL7373, crashed shortly after take off April 15, 1999 while operating cargo flight KE6316 from Shanghai Hongqiao International Airport to Seoul. After take off, the first officer contacted Shanghai Departure, which cleared the flight to climb to 1500 meters (4900 ft): "Korean Air six three one six now turn left direct to November Hotel Whiskey climb and maintain one thousand five hundred meters." When the aircraft climbed to 4,500 feet (1,400 m) in the corridor, the captain, after receiving two wrong affirmative answers from the first officer that the required altitude should be 1,500 ft (457 m), thought that the aircraft was 3,000 ft (914 m) too high. The captain then pushed the control column abruptly and roughly forward causing the MD-11 to enter a rapid descent. Both crew members tried to recover from the dive, but were unable. China Airlines Flight 642, crashed August 22, 1999 while landing at Hong Kong airport during a typhoon that exceeded the plane's crosswind specifications, also flipping onto its back and burning. Three passengers were killed on Flight 642. FedEx Express Flight 87, N581FE, was written off after landing at Subic Bay International Airport, Philippines on October 17, 1999. The aircraft was operating from Shanghai Hongqiao International Airport. Upon landing, the aircraft rolled down the whole length of the runway before plunging into the bay where it was completely submerged except for the cockpit. An excessive approach and landing speed was pointed out as probable cause of the accident. FedEx Express Flight 80, N526FE, crashed at Narita International Airport, Japan on March 23, 2009 while landing in windy conditions. Airport surveillance video showed the aircraft becoming airborne again after the first touch-down, then impacting nose-first the second time and turning onto its left side, erupting into flames; the impact flipped the aircraft upside down. The aircraft finally came to rest some distance left of the runway. The two flight crew members were killed. The MD-11 has a history of problems with its flight control systems, problems that have resulted in numerous accidents and incidents since the aircraft's introduction. In the early 2000s, Boeing improved the flight control software at the urging of the FAA to reduce the possibility of violent unintentional pitch movements. Notes: *Heavy refers to aircraft with "Extended Range" option and aircraft with ER option without additional fuel tank. ER option available on all models. Standard refers to basic original configuration.